I got a pitch pine from Martin Schmalenburg last weekend and the trunk splits a couple inches up from the base so I might try splitting it down closer to the base in spring, if I don’t lose my nerve. I just found a neat video by Bill Valavanis where he uses this technique to redirect a branch. 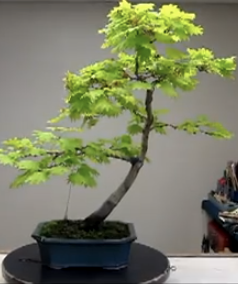 Then he shows the tree displayed in a tokonoma. By the way, my guess is that Mr. Schmalenburg would say that tree reads to the left, not the right, and would have placed it on the opposite side of the scroll. Just my guess, based on his comments in last weekend’s pine workshop at PFM Bonsai.